Fenzi Dog Sports Academy - EasyBlog - Thresholds & Dog Training: When is your dog actually over threshold? I ask this question a lot in my seminars, and get a variety of answers. In a practical sense, most people will comfortably settle on it as being that line between your dog responding to you well — listening to you and following cues — and him not responding well at all, becoming unable to pay attention, and refusing offered reinforcers. I sometimes get descriptions with phrases like "he can think and learn" and "he can't learn anymore." Other times, dog owners describe a dog who is controlling himself and "not reacting" as one that is under threshold, and one that "is reacting" as over threshold. I think that while these are fuzzy descriptions, they speak to the experiences we have when training dogs. We need dogs to respond to our cues, to take reinforcers, and to learn the lessons we're offering. We need dogs that perform trained behaviors, and aren't lashing out or melting down. When we lose that, especially due to emotionality, we have to change what we're doing and help our dog return to the state we need, perhaps aborting that training session altogether. I don't entirely disagree with this working definition. It works to center dog owners on the practical aspects of training dogs — but I don't find it precise enough to get at the threshold you might really want to know about! When someone says their dog is "over threshold," I always want to ask, "which threshold?" Let's talk about what a threshold really is, at its essence. A threshold is just a border between two states. You cross a physical threshold when you go inside your house, and that threshold separates the world outdoors from the interior of your home. Likewise, a threshold from a behavior standpoint is the line your dog crosses as he changes from one state to another. It is not definitionally connected to any states in particular, however. It applies to any two states your dog can shift between. There can be as many thresholds as there are states you can name! Does your dog have a bite threshold? Yes! How about a trembling threshold? You bet! A worry threshold? Yup. A dog that crosses the threshold that leads him to lose his responsiveness to you does impact what you can do to help him, as he's not able to listen to your cues or take your reinforcement consistently, and that limits your choices. But while that may be a point for our concern, and one we all recognize, it's far from the most important threshold he can cross. It just might be the most recognizable, or in some instances, the most dramatic! Long before a dog has reacted aggressively, or lost his ability to respond to you, he began his first steps up that "stress scale." Upon encountering his trigger, he may have been curious at first, then progressed to somewhat worried or concerned but able to cope pretty well, before becoming fearful and frightened, and if nothing changes, possibly progressing to full blown panic! While at first he may have just felt the need to lightly monitor what was going on around him, as he becomes more worried he may progress to defending himself or to desperately trying to gain distance from his triggers! Each of these states has a threshold, and he can be under and over each of these. So, which ones are the most beneficial to know about? Which thresholds should we look for? Since our goal is to help our dogs feel safe in the world and to feel able to concentrate on us easily and give us their full attention, preventing them from feeling a need to escape or defend themselves is important. But what may be more important is recognizing early the states that precede these. We want to identify the first steps your dog takes in that direction. Wouldn't you like to know when your dog is at the threshold between "I feel totally great" and "hmm, I wonder what that is?" Often, the first time a trainer feels that her dog is "over threshold" is when he stops eating his training treats. That then becomes a concrete measure of threshold for that team. But since many dogs can continue to eat while they are quite stressed, it's worth considering that food alone doesn't always tell us enough about the threshold we may care most about. By the time you've lost food, you may have missed a chance for early intervention. If you pay attention to the threshold where they first question their safety, instead of the one where they are unable to eat, we can help them much sooner. The best time to take action to solve your dog's stress problem is when he's only just beginning to have it, not when it's become big enough to interrupt his ability to respond to you and can only outwardly react in his own defense. Developing a more sensitive reading of the first stages of stress, long before your dog stops eating your food and responding well to your cues, means you have a way of identifying when the problem is just starting to creep in, but hasn't yet fully upset your dog. And that is the best time to intervene and solve your dog's problem — either by getting distance, letting him take a break and look at whatever it is he has questions about, or by ending training on a high note before the worry sets in at all, preserving your dog's good attitude toward work and his happy feelings. If you consider your dog "over threshold" at the *very first step* he takes away from feeling great, your interventions will be the most effective at helping your dog return to those great feelings, and I think that should be our threshold of interest. In fact, I call this the "one-step threshold." I have found that one of the most sensitive ways to read early stages of stress, well before most people would think of their dog as "over threshold," is to engage in therapeutic social play. Social play is the first to disappear, long before food for most dogs, and it can serve as an early warning that something is becoming amiss. Social play can help you identify that one-step threshold! While I teach those skills here at the academy in my class "Dealing with the Bogeyman," there are other ways to assess a dog's status early in the game. Trainers like Sarah Stremming and Shade Whitesel each have their own "threshold tests," designed to catch early warning signs that something may not be okay. The key is to identify the test that works best for your dog — the one that gives you the earliest possible warning sign that things are not okay. The finer our measurements are of where our dog is emotionally, the sooner we'll identify that they're taking those first steps away from feeling great, and the more effectively we can help that stress dissipate. Identify your dog's one-step threshold and you won't have to worry as much about the ones further down the line! Your dog has many thresholds, and while the most obvious one may be the one between displaying big, dramatic behaviors and not displaying them, it may not be the one you truly want to identify or use in your training. Instead, develop the most sensitive measures you can for your team — and help your dog feel better when he's only just starting to question the situation! 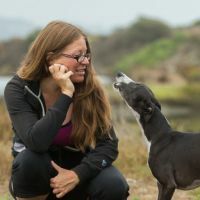 Amy Cook, Ph.D. has been training dogs for over 25 years, and through Full Circle Dog Training and Play Way Dogs in Oakland, CA, has been specializing in the rehabilitation of shy and fearful dogs for almost 20 years. She is a Certified Dog Behavior Consultant through the IAABC, a longstanding professional member of the APDT, and was one of the first trainers nationally to become a Certified Professional Dog Trainer through independent evaluation. She is a graduate of the SFSPCA academy for dog trainers and has attended all 4 "chicken camps" in Hot Springs, Arkansas, taught by Bob Bailey. Amy also owns the "shy-k9s" list on yahoo, a 4000-member group dedicated to the rehabilitation of fearful dogs, and has moderated there since 2001. Amy returned to school in 2006 to get her PhD in Psychology from UC Berkeley. Her research focused on the dog-human relationship and its effect on the problem solving strategies dogs employ. She has also studied causal inference in dogs and toddlers with Anna Waismeyer and Alison Gopnik, and currently works with Lucia Jacobs on dog olfaction. She has extensive experience as a graduate student instructor, having taught sections of Introductory Psychology (both in person and online), Human Emotion, Developmental Psychology, Social Psychology, Stigma and Prejudice, Statistics, Animal Cognition, and has taught Fundamentals of Psychology and Developmental Psychology as a full instructor. Monday, 21 January 2019 Thresholds & Dog Training: When is your dog actually over threshold?